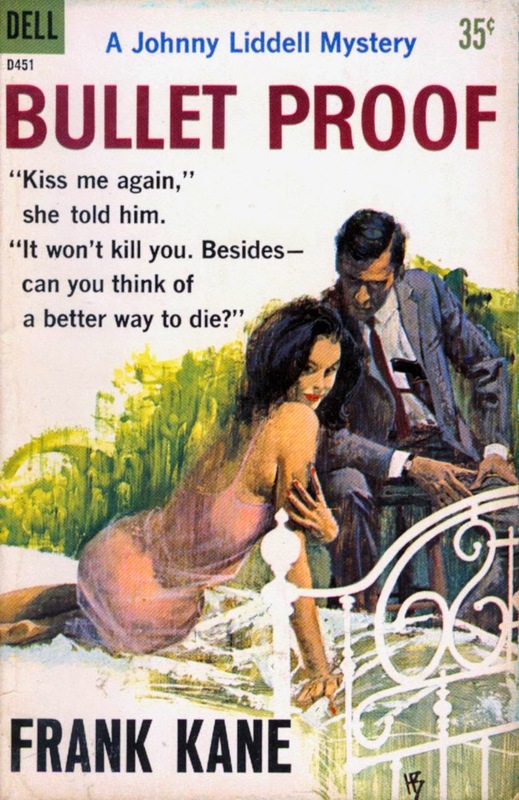 One of the profound delights of my writing this new blog is discovering pulp-era authors whose work I have somehow neglected to read over the years, but who I now want to look up. Another name to add to that growing list: Frank Kane. He was the Brooklyn-born inventor of hard-fisted New York City private eye Johnny Liddell, who starred in 29 novels and almost three dozen short stories between the end of World War II and the Summer of Love. Liddell evidently made his initial appearance in “Morgue Star Final,” a short story published in the July 1945 edition of the magazine Crack Detective Stories. His creator, Kane, turned 32 years old that same month. He was a graduate of the City College of New York, who had gone on to attend law school. But according to the recollections of his granddaughter Maura Fox, Kane dropped out sometime before graduation in order to make money faster (he hoped) in journalism. A 1968 obituary in The New York Times says that Kane’s writing career began at the New York Journal of Commerce, “where he became editor of the wine and spirits page.” Fox explains that her grandfather also “served a couple of years as a columnist for the New York Press [and] was Editor-in-Chief for the New York Trade Newspapers Corporation.” Kane did public relations work, as well, putting in two years (1943-1945) as P.R. director of the Conference of Alcoholic Beverages Industries, working part of that time “with government officials to end the prohibition of consumption of alcohol,” states Fox. Kane’s introduction to penning mystery and crime fiction began in the mid-1940s, when he started turning out scripts for the popular radio-drama series The Shadow. He exhausted half a decade or more working on that show, but also wrote for “a multitude of radio programs,” as Fox recalls. “In the detective-adventure genre, he spent three years writing Gang Busters. He also wrote for Counter Spy, The Fat Man, Casey, Crime Photographer, Mr. Keen, Tracer of Lost Persons, The Lawless Twenties and Nick Carter, Master Detective. He also created Call the Police for Lever Brothers, and created, wrote, and produced Claims Agent for NBC, which was based on Kane’s character, Jim Rogers. And in 1947, Frank Kane was selected to write the Coast Guard documentary You Have to Go Out, starring Robert Young.” The Internet Movie Database (IMDb) adds that Frank Kane later did a stint in Hollywood, “writing for the television networks, including [the shows] Special Agent 7 (1958), The Investigators (1961),” and, most memorably, Mickey Spillane’s Mike Hammer, which showcased Darren McGavin in the title role. One of Kane’s most popular standalone novels, Key Witness (1956), was made into a 1960 film of the same name. There was a dull, crunching sound as the man’s nose broke. Liddell chopped down at the exposed back of the other man’s neck in a vicious rabbit punch. Sammy hit the floor, face first. Didn’t move. She slid out of his arms, shrugged her shoulders free of the gown. It slid down past her knees, and she stepped out of it. Her breasts were full, pink-tipped; her waist trim and narrow. Her legs were long, tapering pillars; her stomach flat and firm. Her eyes dropped down to her nakedness, rolled up to his face. However, blogger Edward Piercy observes in his excellent review of the 1953 novel Poisons Unknown that Liddell’s creator had some writing quirks: “Kane breaks with tradition in his novels, putting his P.I. narrative in third-person. He has a habit of using Johnny Liddell’s full name throughout the book, long after the character has been introduced. It is all too frequently ‘Johnny Liddell did this’ or ‘Johnny Liddell did that.’ He should have cut some of them out. He also has a propensity to call a female character ‘the blonde’ long after she has been introduced. I chalk this down to a 50’s era obsession with blondes.” Meanwhile, crime-fiction historian Marvin Lachman has observed that Kane often “‘borrowed’ from himself” when it came to descriptive phraseology. The redheaded secretary lay crumpled on the office floor, her blouse ripped to the waist. Blood trickled from her mouth. The redheaded divorcee sprawled across the bed, the black silk sheet baring her lovely body--and her gaping throat. The black-haired B-girl lay broken across the steering wheel of the bomb-shattered car. Her open eyes stared sightlessly at the tilted floor. Each had walked into a trap meant for private eye Johnny Liddell, set by the crime syndicate out to get him. Each was a score Johnny had to settle--if he could live long enough to see the end of three brutal bouts with murder! If a reader wasn’t won over by that summation, he (or, less likely, she) would certainly have been seduced by the 1960 paperback cover embedded at the top of this post. 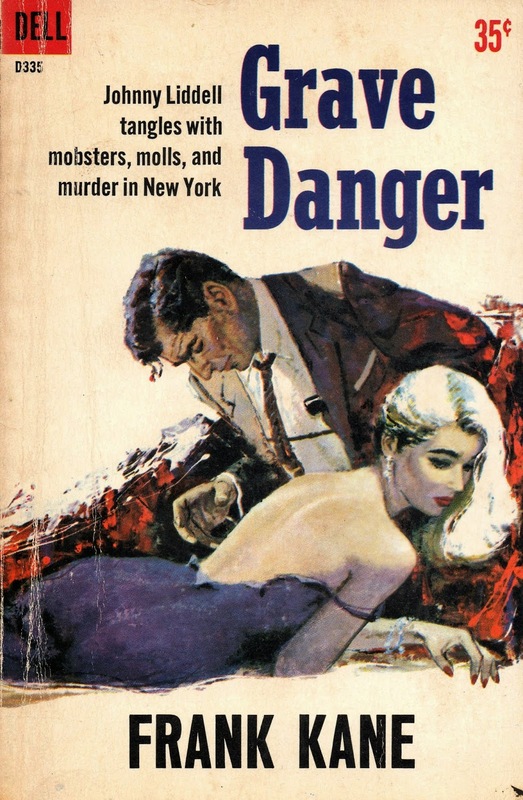 Featuring an illustration by Harry Bennett, who created a number of Kane novel fronts in the mid-20th century (as well as jackets for works by Agatha Christie, Richard S. Prather and Ellery Queen), it contains all the requisite elements of hard-boiled detective fiction: a callipygous blonde (no doubt endangered), a well-heeled shamus (looking as if he’s been shot or clubbed ... or maybe he’s just planning to fondle the blonde’s behind), and alliterative cover lines that emphasize the noirish nature of the story inside: “Johnny Liddell tangles with mobsters, molls, and murder in New York.” Bennett established a distinctive style for the Liddell jackets, almost all of which found the gumshoe snuggled up near a woman of drool-inducing proportions, and were notably spare as far as background details went. 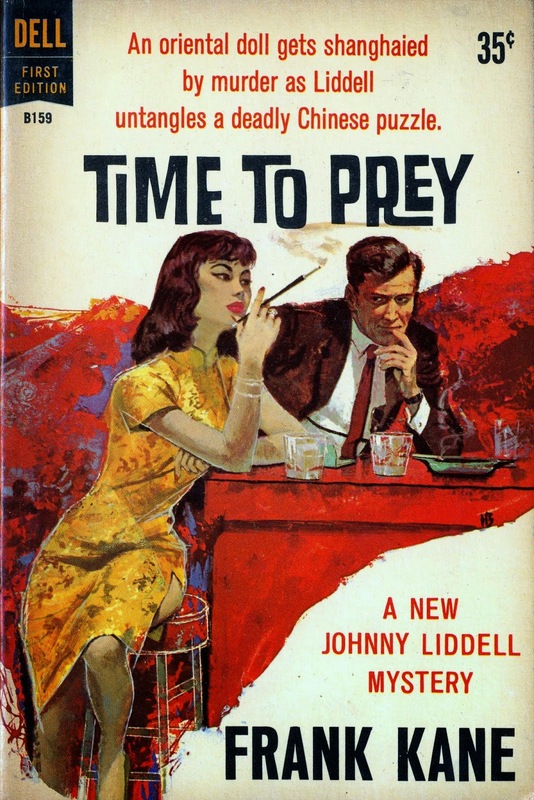 Other artists--among them Victor Kalin and the renowned Robert McGinnis--tried their hands at illustrating the Liddell novels, but it’s the Bennett fronts (including Time to Prey and Bullet Proof, both of which are also featured here) that hold my eye best. Unfortunately, Frank Kane’s life was cut way too short. He died on November 29, 1968, at his home on Long Island, New York, the victim of a heart attack at age 56. Granddaughter Maura Fox remembers that he perished “with many projects pending.” It’s likely that some of those unfinished undertakings were Liddell stories that we will never have a chance to read. But at least the author left behind an abundance of works that can still be found in used bookstores--not just his private-eye tales, but also standalones, TV series novelizations, and a pair of non-fiction books, The Anatomy of the Whiskey Business (1965) and Travel Is for the Birds (1966). So, a career well spent? As alcohol-industry promoter Kane no doubt said himself on many occasions, I’ll drink to that. READ MORE: “Richard Stark, Harry Bennett, Parker Book Covers, and The Seventh (a Westlake Score),” by Nick Jones (Existential Ennui); “Archived Review: Frank Kane -- A Real Gone Guy,” by Steve Lewis (Mystery*File); “Bouchercon 2016, the Books: ‘This Is a Job for the Meat Wagon, Ed,’ a Look at Frank Kane,” by Peter Rozovsky (Detectives Beyond Borders). Coincidentally, I have GRAVE DANGER near the top of my "to read" pile this very moment. Thanks for all the great background info. I'm really looking forward to reading it now! Oddly, GRAVE DANGER is the wallpaper on my laprop as I write this. I read most of my Frank Kane inmy teens, in the 60's. The covers--along with the Brett Halliday covers--were always among my favorites.